Inbound Channels must be renewed before their expiry so that you can continue to use them. Inbound Channels once expired cannot be renewed. In that case (post expiry) you can buy new Inbound Channels but please be aware that you will incur one time setup cost for new channel purchases. 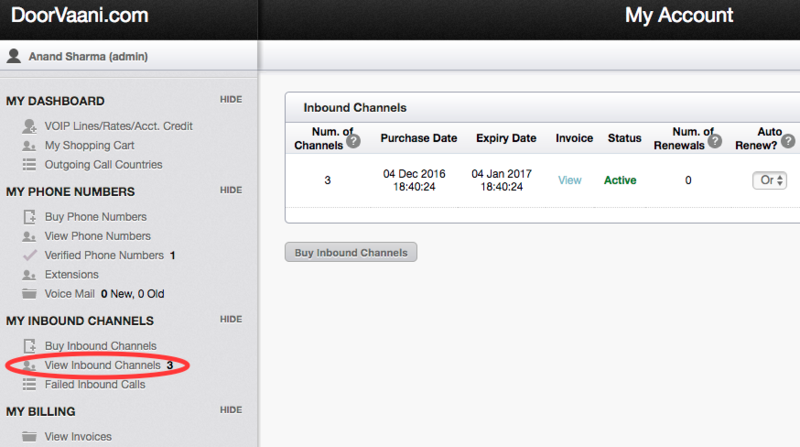 It is advisable to use our “Auto Renewal of Inbound Channels” renewal feature to avoid loosing the channels and save your time. After making your selections please click on the “Add to cart” button. Once your order is in the shopping cart you will be able to checkout your shopping cart to complete your purchase. Your purchases will be immediately delivered to your account as soon as you pay for them. Tip: If you have more than one Inbound Channel in the block, and you do not want to renew all of the Channels in the block, you can select a partial quantity for renewal.